While late payments from B2B customers were reported to occur less frequently, the average proportion of overdue invoices increased to 50%. Businesses were significantly impacted. 21.5% of respondents have had to correct cash flow, 20.3% to postpone payments to suppliers and 17.5% have lost revenue. The proportion of uncollectable B2B receivables decreased slightly and bankruptcy remains the main reason for write-offs. After a minor increase in 2017, the proportion of total B2B sales on credit in the Americas declined to 41.3% this year. The use of trade credit in B2B transactions is lower in all countries surveyed, with the USA and Brazil registering the biggest year-on-year decreases (5.7% and 4.9% respectively). Respondents in Brazil remain the most inclined to offer credit terms (an average of 42.8% of B2B sales on credit terms). Respondents in the US are the least likely to extend credit (on average, 39.8% of B2B sales on credit terms). 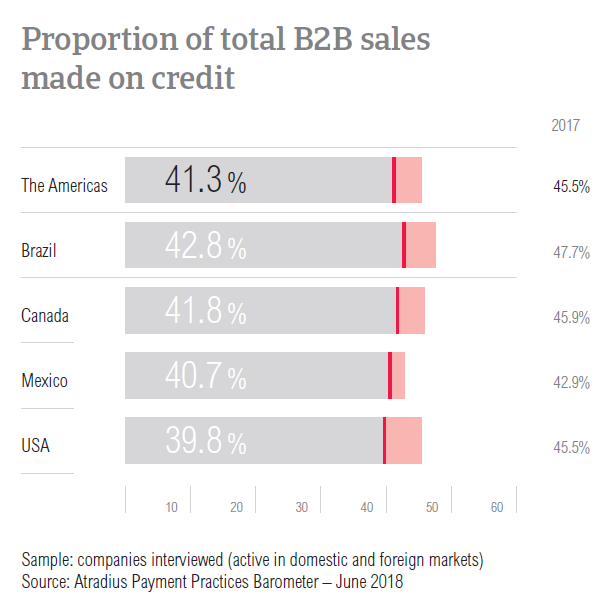 Respondents in the Americas are far more likely to sell on credit terms to their domestic B2B customers than to their foreign B2B customers (48.6% versus 33.9%). Domestic credit terms are granted mainly to facilitate sales and local expansion, to nurture relationships and attract new customers and because credit sales are common practice. Respondents in the Americas also believe that selling on credit domestically builds trust, it is easy and safe. Respondents don’t extend credit terms when the buyer’s payment behaviour is poor and when they have insufficient information about their domestic customer’s business or payment performance. We firmly believe that by selling on credit we can grow our customer base; in addition, our company has a secure sale and an increase in profits. Businesses in the Americas trade on credit with foreign B2B customers to enable international sales, to reward loyalty and to attract new customers. Reasons like trust, convenience and trade credit as a common practice were mentioned less frequently. Credit terms are not extended when currency, economic or political risk in the customer’s country is high and if there is a lack of information on the foreign customer’s business or payment performance. International customers sometimes request this form of payment; but less often than domestic customers. We trade on credit mainly to increase revenue. 90.3% of survey respondents in the Americas reported late payments by their B2B customers. Compared to one year ago when 91.3% of respondents reported this, there was a minor improvement. Mexico is the only country in the survey where there was a higher percentage of respondents reporting payment delays. Late payments seem to occur slightly more frequently with domestic B2B customers. The proportion of overdue B2B invoices in the Americas increased from an average of 48.8% in 2017 to 50.0% this year. All countries surveyed in the Americas – with the exception of the USA – reported increases. Respondents in Canada experienced the most significant increase of almost four percentage points. In contrast, the proportion of past due B2B receivables in the US declined from 52.0% last year to 47.6% in 2018. In 2018, the average Days Sales Outstanding (DSO) figure recorded in the Americas is 37 days, two days longer than in 2017. The majority of respondents in the region (51.0%) do not expect to see any changes in their company’s DSO figure over the coming 12 months. Of those expecting changes, 20.8% foresee a slight increase while 13.6% a slight decrease. Mexico (94.4%) and the USA (90.9%) had the highest percentages of respondents reporting frequent late payments by their B2B customers. The percentage in the USA declined markedly from last year when it was the highest in the region. Respondents in Canada were the least likely to report frequent payment delays (on average, 86.7%). Mexico continues to be the country with the highest proportion of domestic and foreign past due B2B invoices. 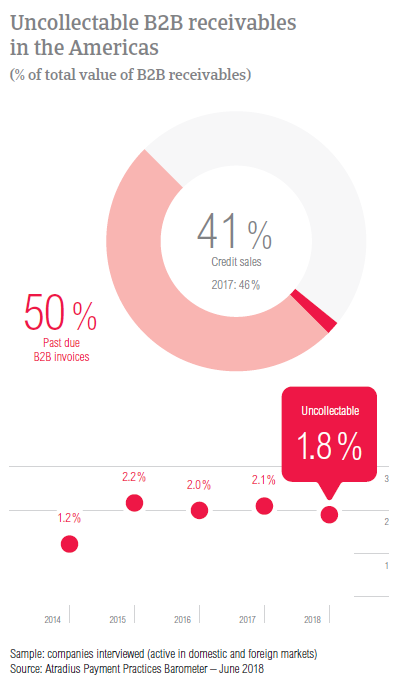 Additionally, the proportion of overdue B2B invoices here increased from an already high average of 55.4% in 2017 to 57.9% this year. Interestingly, this is not reflected in the country’s DSO figure, which decreased by three days in 2018. After Mexico, the USA is the most impacted by late payments (on average, 47.6% of B2B invoices overdue). Brazil has the lowest average proportion of domestic and foreign past due B2B invoices in 2018 (45.5%). In 2018, B2B customers of respondents in the Americas are enjoying longer payment terms. Domestic B2B customers of respondents in the Americas are given, on average, 31 days to fulfil their payment obligations. This is four days longer than in 2017. By country, a significant increase of 13 days occurred in the USA. Foreign B2B customers are given, on average, 29 days to settle their invoices (27 days in 2017). In 2018, payment terms to foreign B2B customers decreased significantly in Mexico and increased significantly in the USA. Despite these changes, respondents in Mexico offered the most lenient payment terms to their domestic and foreign B2B customers (on average, 32 days). In contrast, respondents in Canada set the shortest payment terms in the region (on average, 25 days). Respondents in Canada and the USA are the least likely and respondents in Mexico the most likely to differentiate payment terms between domestic and foreign B2B customers. The main reasons for differentiation mentioned in all countries surveyed are internal policies and payment terms directed by law. Other prominent reasons for differentiation are industry practices (the USA and Brazil), the economic situation in the export country (Mexico) and financial risk related to the export transaction (Canada and Mexico). Payment delays in the Americas have remained largely stable in 2018, with a decrease of two days for domestic receivables (on average, 29 days) and a decrease of one day for foreign receivables (on average, 36 days). Respondents in the USA reported decreases in payment delays from both their domestic and foreign B2B customers. In contrast, and despite already reporting the longest delays in the region, respondents in Mexico declared further increases. Similarly to what was reported in 2017, the main reasons for payment delays by domestic B2B customers in the Americas are insufficient availability of funds (49.6% of respondents) and the buyer using outstanding invoices as a form of financing (24.7%). Compared to 2017, the percentage of respondents reporting insufficient availability of funds increased in Brazil, Mexico and the USA. On the other hand, the percentage of respondents stating buyer using outstanding invoices as a form of financing decreased in all countries but the USA. The main reason for payment delays by foreign B2B customers is the complexity of the payment procedure, cited by 32.6% of respondents in the Americas. This is the same as in 2017 when it was cited by 29.7% of respondents. The percentage of respondents citing this as a reason for payment delays increased in all countries except for Brazil. The most significant increase was recorded in Mexico, where more than 35% of respondents cited complexity of the payment procedure as the top reason for payment delays. The second most frequently cited reason for payment delays by foreign B2B customers is insufficient availability of funds, reported by 28.7% of respondents. The majority of respondents in the Americas (35.9%) said that payment delays did not have a significant impact on their businesses. However, 21.5% reported that they needed to take special measures to correct cash flow and 20.3% said that they needed to postpone payments to suppliers. For 17.5% of respondents, payment delays had a more significant impact as these led to revenue loss. 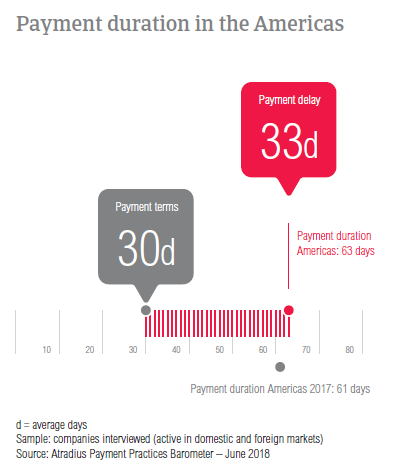 Changes in payment terms and payment delays have led to an increase in the average payment duration in the Americas from 61 days in 2017 to 63 days in 2018. The USA and Canada have experienced an increase while Mexico and Brazil have experienced a decrease. The average payment duration in Mexico is 71 days, four days shorter than in 2017. Despite this improvement, it takes respondents here the longest time to convert B2B invoices into cash. 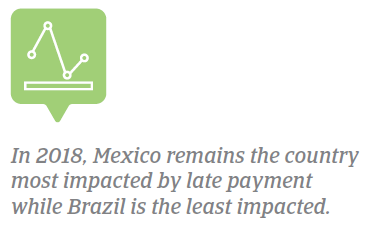 Brazil reported no changes in payment duration compared to last year (on average, 63 days). Canada has the shortest average invoice to cash turnaround (54 days in 2018). Following decreases in the USA and Mexico, the average proportion of uncollectable B2B receivables in the Americas declined from 2.1% in 2017 to 1.8% this year. There was no change in the averages recorded in Canada and Brazil. In 2018, Brazil’s 2.5% is still the highest percentage of uncollectable receivables. 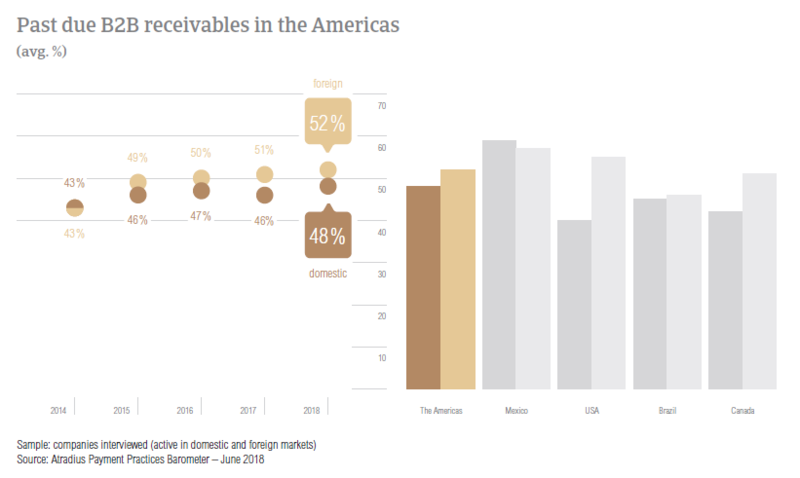 Uncollectable receivables in the Americas were experienced most often with buyers from the consumer durables, business services, services and construction sectors. B2B receivables were reported to be uncollectable mainly because the customer went bankrupt or out of business. 51.0% of respondents in the Americas expressed this viewpoint, a higher percentage than in 2017. Secondary reasons were the inability to locate the customer, the failure of collection attempts and the old age of the debt. In 2018, respondents in the Americas gave their customers 31 days, on average, to fulfil their payment obligations. By sector, B2B customers in the agriculture and food sectors enjoy the most lenient payment terms (on average, 33 days and 35 days respectively). In contrast, the shortest payment terms were given to B2B customers in the paper sector (on average, 17 days) and to those in the chemicals sector (on average, 22 days). 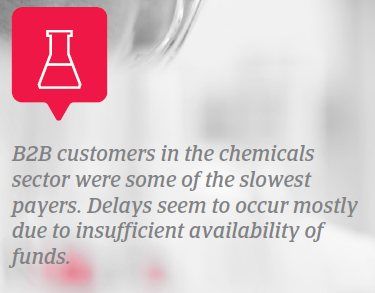 B2B customers of respondents in the machines and chemicals sectors seem to take the longest to pay. Payment delays in these sectors average, 40 and 38 days respectively. The main reasons for payment delays in the machines sector were the complexity of the payment procedure and insufficient availability of funds. Respondents in the chemicals sector said that payment delays occurred mainly because of insufficient availability of funds and the buyer using outstanding invoices as a form of financing. The majority of respondents in the Americas reported that they do not expect any changes in the payment behaviour of their customers in the machines and chemicals sectors. If a change is anticipated, there is greater expectation that it will be positive (35% in the machines sector, 37% in the chemicals sector) than negative (25% in both industry sectors). Growing insecurity due to – among others - protectionist measures and the NAFTA renegotiations may be influencing export trade within the region. Based on our survey results, 33.3% of respondents said that they currently do not trade with other NAFTA members, 26.5% said that up to 50% of their export trade is done within NAFTA, and 23.7% that the percentage of trade within the region is higher than 50%. 16.5% of respondents seem to trade only within NAFTA. However, has trade between the NAFTA members changed compared to the year before? The USA had the highest percentage of respondents (52.7%) stating that they do not trade with other NAFTA members. 19.8% of US respondents said that up to 50% of their trade is done within the region, and 15% that more than 50% is done with NAFTA trading partners. It also had the lowest percentage of respondents who said that they only trade within NAFTA (12.6%). The majority of respondents in the USA (68.5%) said that compared to one year ago, there were no changes in their exports to Canada. 19.8% said that trade with Canada increased slightly and 7.4% that it increased significantly. A smaller percentage of 4.3% said that they reduced their exports to Canada only slightly. The main reason behind these changes is the general economic environment (reported by 75% of respondents). Similarly, the majority of respondents in the USA (68.3%) did not report changes in their percentage of trade with Mexico. In 2018, 15.2% of US businesses trading with Mexico increased their activities slightly and 6.9% significantly. At the same time, 6.8% of US businesses seem to export to Mexico slightly less and 2.8% significantly less. Most respondents in the USA (57%) said that the changes are a result of the general economic environment. Canada had the highest percentage of respondents (22.1%) stating that they only trade within NAFTA. 26.2% of Canadian respondents said that up to 50% of their export trade is done with the USA and Mexico and 21.4% that more than 50% is done within the region. 30.3% of Canadian respondents said that they do not trade with other NAFTA members. 58.3% of respondents in Canada said that in 2018 the percentage of trade with the US has remained unchanged. 20.6% of respondents reported that it slightly increased and 11.4% that it increased significantly. In contrast, 8% have decreased their trading activities with the USA slightly and 1.7% significantly. Most Canadian respondents (60.9%) said that these changes are in light of the general economic environment. 66.7% of respondents in Canada said that their export trade with Mexico remained unchanged in 2018. Moreover, 18.7% of respondents have slightly increased and 8.0% have significantly increased exports to Mexico. Only 6.7% of businesses in Canada reported slightly fewer exports. According to 66.7% of respondents, these changes occurred because of the general economic environment. Mexico had the lowest percentage of respondents (18.3%) who said that they are not trading within NAFTA. More than 30% of respondents sell in excess of 50% of their exports to NAFTA trading partners. For 15.6%, export trade occurs only with NAFTA partners. 37.6% of businesses in Mexico said that compared to one year ago, their percentage of export trade with Canada has not changed. High percentages of respondents said that they have increased their trading activities: 30.9% reported a slight increase and 19.4% a significant increase. In contrast, 2018 brought a slight reduction for 10.3% of businesses in Mexico; and a significant reduction for 1.8%. 80% of Mexican respondents attributed these changes to the general economic environment. Similar response rates were observed for export to the US. 38.7% of Mexican respondents reported no changes, 28.9% slight increases and 13.9% significant increases. A slight decline was reported by 13.9% of respondents and a significant decline by 4.6%. Once more, the main reason behind the changes is the general economic environment (stated by 68.8% of respondents). Among the four countries surveyed in the Americas, Brazil has the highest percentage of uncollectable receivables. 2.5% of the total value of B2B receivables was written off as uncollectable – no change from last year. The main reason for write-offs remains bankruptcy – and the percentage of respondents stating this went up from 53.4% in 2017 to 54.7% this year. 33.9% of Brazilian respondents believe that the ease of resorting to bankruptcy courts is positive for the viability of companies. 20.2% strongly agree with this statement while 30.3% are neutral. Only 9.2% disagree and 6.4% strongly disagree. Similar findings were observed in respect to the effect of bankruptcy on the effectiveness of the recovery mechanisms of the creditors. 33.9% of Brazilian respondents said that they agree that the ease of resorting to bankruptcy courts diminishes effectiveness and 14.7% that they strongly agree with this statement. The majority of respondents (34.9%) were neutral. Lower percentages of respondents disagreed (10.6%) or strongly disagreed (6.0%) with this concept.